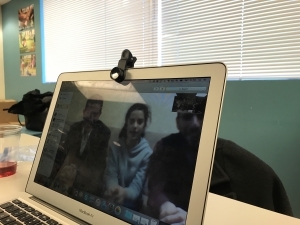 This brief, softly-spoken interchange occurred between Samya, a 14-year old American girl, and Basma, a 12-year old Jordanian girl, who on Saturday participated in Learning Life’s first Middle East “virtual exchange” or live internet dialogue between families in Washington D.C. and Amman, Jordan. Not all of this first Middle East dialogue broached political topics. Indeed, much of this introductory dialogue – between three family participants in Amman, and six in Washington, plus observers and staff – focused on learning each other’s names, hobbies, and aspirations. Basma, for instance, learned that 11-year old James also likes to draw, and asked him what he likes to drawn, so James drew a neighborhood road to show her. Kaliah and Kristin, 7 and 8 respectively, spent much of their time during the dialogue drawing, and Kaliah also presented her drawing for the Jordanian family to see. Basma and Samya also learned that they both want to become doctors, though of different kinds: Basma, a pediatrician because she loves children, Samya, a plastic surgeon because she wants to help people with deformities. But the conversation did occasionally turn toward social and political issues as the families answered the questions we posed, particularly “what do you like about your own country?” and “what would you like to learn about the other family’s country?” On the Jordanian side, Fawwaz, Basma’s uncle, and on the American side, Janelle, Kristin and Bianca’s mother, expressed their respective views on how children are and should be raised. As one might imagine, there were differences. Fawwaz noted that while American children are expected to strike out on their own upon finishing their schooling, Jordanian children are expected to live with their parents until they marry, and the expectation is often stronger for daughters than sons. This is sometimes borne of economic necessity, as Fawwaz noted, but it is also expressed as a social custom intended to protect still young and vulnerable children. Janelle, in contrast, expressed her interest in instilling independence in her daughters, to find gainful employment so that they “do not have to settle” for a partner who fails them or mistreats them. 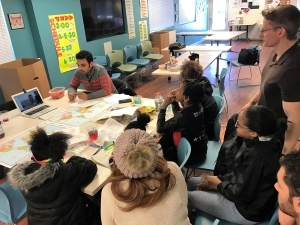 This first Middle East dialogue was part of Learning Life’s Citizen Diplomacy Initiative (CDI), which engages lower-income American families in live, internet dialogues and project collaborations with similar families in other nations. Learning Life launched CDI in August 2016 with a series of introductory dialogues between families in Washington D.C., Porto de la Libertad, El Salvador, and Dakar, Senegal. 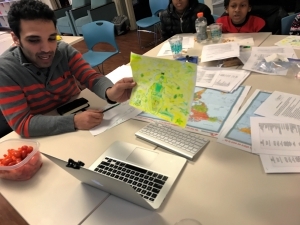 This year, we are working to carry out the first project collaborations between families in D.C., Dakar, and communities to be determined in El Salvador, Jordan and/or Palestine. 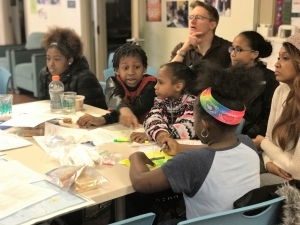 Through CDI dialogues and project collaborations, Learning Life aims to nurture more informed, skilled, connected and caring global citizens in the long-term. Stay tuned for more international dialogue news! Thanks to Omar Batterjee and Sarah Bel Hadj Nasr for assisting with language interpreting and photo/video recording, respectively, during the dialogue. Thanks also to John Mathena for connecting us to, and helping Learning Life to win a State Department grant to bring our Middle East dialogues to life.